If you were forced to eat only one type of food for the rest of your life, many people would choose Italian! 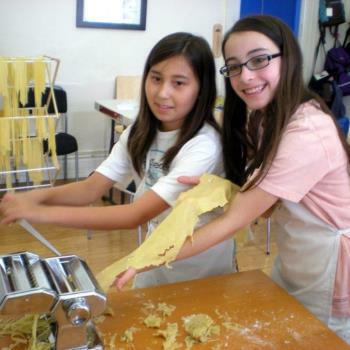 Start your obsession with Italian food by making and cooking famous dishes from different regions of Italy. Risotto from Lombardy, Ragu alla Bolognese from Bologna, Pizza from Naples, Seadas from Sardinia, Bruschetta from Lazio, Farinata from Liguria, and Pasta with pesto from Genoa sparkled with Parmigiano Reggiano. We'll finish up with a tasty Cannoli from Sicily. By the end of the week you will see how Italians use a handful of ingredients to create awesome food that sings! Referral Discount Receive a $30 refund or a $50 future credit for a new camper family (siblings excluded) you refer who has never attended any previous Celsius and Beyond camp in this or prior years. Discount will be finalized when that new family you refer makes and pays for a reservation for a week long camp. Please contact us when your referral family indeed signs up for quickest processing of your discount. All refunds will be made by check in September. Please list the first and last name of the child and a parent's last name below as your referral. You can provide more than one family to receive more than one referral discount. Temple Emanuel Members $50 discount per account/family for current active Temple Emanuel members. Please enter the discount code provided by the synagogue in the My Cart page by clicking the link "Enter discount/promotion code". This is the page after the "Proceed to Checkout" page. We will confirm with the synagogue for each family that claims this discount. If your membership is not current, you authorize Celsius to charge the $50 that was listed as a pending credit to your payment method on file. $20.00 Multi-Session Discount Sign up for two total weeks in a season or two siblings sign up for one week and you'll get $20 off both sessions! $5.00 Multi-Session 3 Week Discount Sign up for three total weeks in a season and you'll get a total of $25 off each session!